The idea of increasing the solubility of the phosphorus in bones by treating them with sulphuric acid was advanced by Escher in Germany and demonstrated by Justus von Liebig in 1840. In 1842 John Bennett Lawes took out the first patents on superphosphate in the UK and began manufacture in Deptford in 1843. With Henry Gilbert, an agricultural chemist, Lawes founded the Rothamstead Laboratory (later Experimental Station) in 1843 and demonstrated the value of his patented product. The earliest reports on the use of fertiliser in Australia go back to James Cuming's experiments on his family farm with product made from bones and sulphuric acid. It seems likely that Cuming's early experiments and the Rothamstead work led Cuming later to enter the sulphuric acid and fertiliser business mentioned above (Cuming Smith and Co.). In 1881 the South Australian Government brought Professor J. D. Custance from England to be Director of Agriculture. He conducted a series of fertiliser trials on cereals at Roseworthy Agricultural College, which were extended by Professor William Lowrie from 1887 onwards. He reported the beneficial residual effects of superphosphate on the clover pastures which followed the cereal crop. The earliest Australian manufacture was at Yarraville in Melbourne (Fig. 2) by Cuming Smith and Company in 1878. Other plants were built by the Adelaide Chemical Works Company at Torrensville near Adelaide in 1883, and by CSR at Balmain in Sydney in 1886, almost wholly for export for use on sugarcane in Mauritius, Java and Fiji. 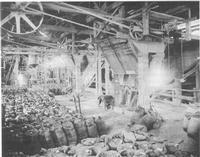 2 Commonwealth Fertilisers and Chemicals, Yarraville, Victoria, superphosphate shed; late nineteenth century. By the turn of the century, there were five plants, with Adelaide Chemical building a second plant at Port Adelaide in 1894 and the Wallaroo Phosphate Company at Wallaroo in 1899. People in Bright Sparcs - Cuming, James; Custance, J. D.; Lowrie, W. R.